Repairs of the high school’s tennis courts get the go-ahead. 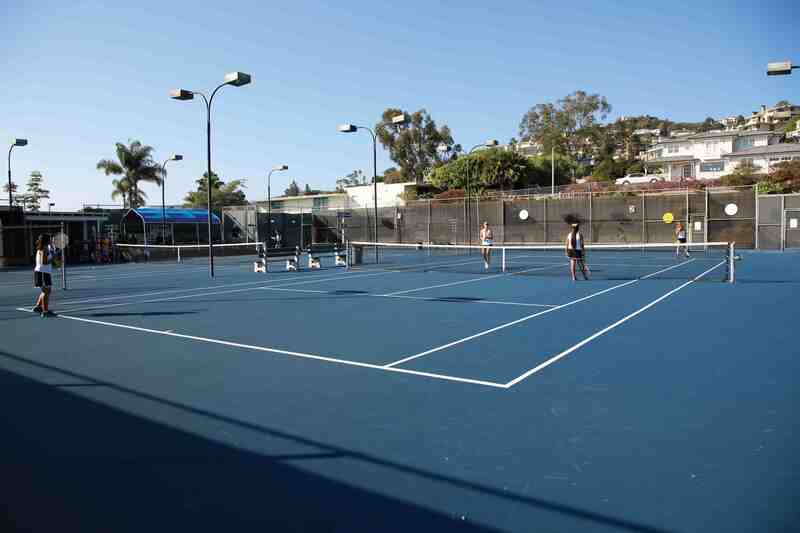 With some residents calling them the “worst tennis courts in Orange County,” plans were given the go-ahead this past Tuesday to refurbish rather than upgrade the Park Avenue courts across from Laguna Beach High School. The decision will cost $620,000 and was made at a joint meeting between the Laguna Beach City Council and Laguna Beach Unified School District board. Resolving a year of disagreements, the courts will be repaired rather than equipped with post-tensioned slabs that prevent cracking, and the city and the district will split costs 70-30 as previously negotiated. Repairs at the community pool, which is adjacent to the courts and also used by high-school students, were also agreed upon. Instead of upgrading the tennis courts with a longer-lasting post-tensioned apparatus – triggering requirements that tripled projected costs – the city proposed to sandblast, replace cracked concrete, patch, level and resurface with a premium sealer. The sealer, according to the city report, will reduce cracking and water seepage. The council unanimously approved the plan while the school board will officially vote on both improvement projects at its meeting Tuesday, Jan. 27. The city and the school district considered post-tensioned construction a year ago. Total costs escalated to $1.36 million because the post-tensioned project is considered “new construction” and triggered costly requirements to reconfigure access for the disabled and a review by the Division of the State Architect. The city balked at paying for the more expensive upgrade pushed by the district. Last week, the stalemate was resolved with face-to-face talks. School board members agreed to jettison plans for post-tensioned slabs following a presentation of a city soils report showing no conditions at the courts warranted the stabilizing post-tensioned slabs. Bids on post-tensioned courts, considered higher quality with greater longevity, were sought at the request of members of the public, board member Jan Vickers explained. No one anticipated costs would triple due to unexpected “new construction” requirements, she said. “We, as a city, have the worst tennis courts in all of Orange County,” said resident Tiana Hamilton, whose children played tennis in competitions at other schools in the county. “I don’t think that’s anything to be proud of.” Hamilton and her husband Paul urged the two governing boards to choose quality. Resident Howard Hills admonished the school district for “never” comparing the high school courts to the quality of courts at schools in other cities. Besides resurfacing playing surfaces, the improvements will also include new LED lighting, refurbished lighting standards, upgraded fencing, windscreens and nets, and a new drinking fountain and viewing benches. “Esthetically, it will be a beautiful facility,” said Ben Siegel, the city’s director of community services, following his report at the meeting. The courts fell into disrepair and regular maintenance stopped in 2008 when improvements were first contemplated. Problems at the courts now include cracking, poor drainage and buckling resulting from the lack of maintenance rather than structural failures, Siegel reported. A retaining wall at the courts will also be repaired at an additional cost of $430,000, also split between the city and district. Pool repairs are expected to be completed by the summer when court repairs will begin. A second community pool is being considered at Lang Park in South Laguna, Mayor Bob Whalen said at the meeting. Residents also complained about the view-blocking potential of new landscaping along a bluff at the high school. The slope around the high school athletic field and near the baseball dug-out was recently planted with sycamore and eucalyptus trees, among other plants, for an approved cost of $122,000. Ann Christoph from Landscape Support Services, Inc., brought her already-implemented design for residents to see. Residents said the plans were being kept from them earlier. Christoph said eight eucalyptus and native oaks were planted mainly to shade the dug-out. An article in the Jan. 23 edition about improvements at the high school, “Tennis Courts, Pool Improvements Get Go-Ahead,” incorrectly described the type of landscaping planted and landscape architect Ann Christoph’s relationship to the project. Christoph designed the landscaping plans that did not include sycamore trees, which were installed by contractor Landscape Support Services.